I kind of grew up in the country. I drove 20-30 minutes to get to my high school. And now, I kind of live in the city. We walk a couple blocks to Jack's school. Growing up, our mail was delivered by someone driving in a car. Now an evening walk often includes a meet-up with our mailman and his wife & dogs, because he lives a block away and knows me by name because he walks his route each day. It's not like I didn't notice the changes when I made the switch after college. However, the more summers I spend with my kids in our neighborhood, the more I realize that our neighbors make up a pretty awesome community to be a part of. This weekend was a lazy one as far as our plans went, but in actuality, it was packed with fun. A walk to the playground led to Jack spending the next three hours playing kickball and baseball with a group of friends he just happened to run into. There were cozy car cruises down the front sidewalk and big kids jumping our back fence to play with my crew. Our neighbors invited us to share in their new vegetable garden so my kids planted and watered for a solid hour or two. 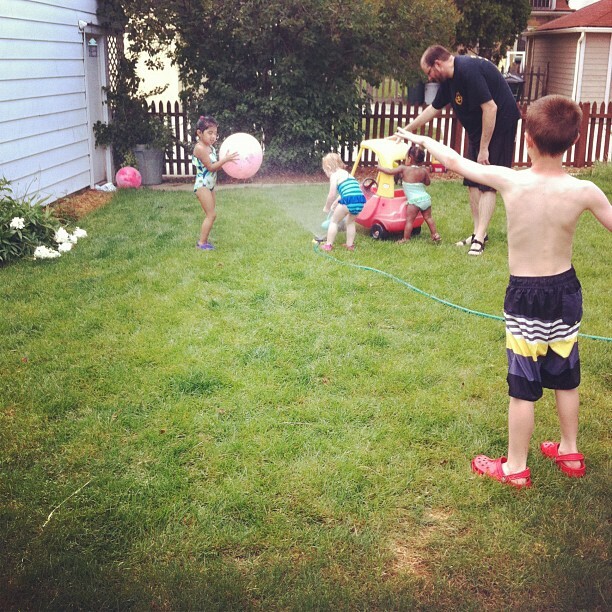 When all that work was done, my kids were passed over the fence to join in some sprinkler fun. And in the midst of all that, there were some impromptu adult get-togethers (that unfortunately we missed due to previously made plans or sheer exhaustion). This is a seriously fun place to live!